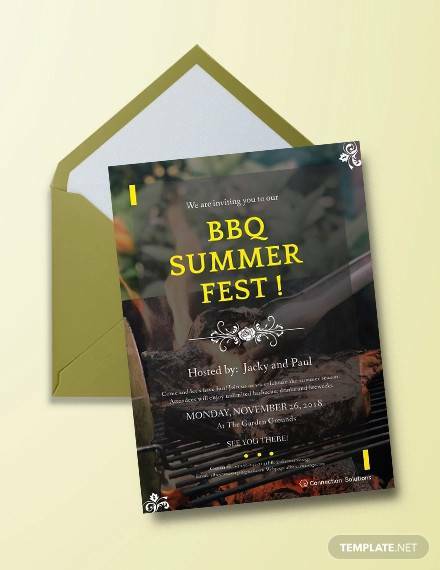 Barbecue or BBQ invitation templates are required to throw party or lunch invitation on various occasions such as birthday, corporate luncheon and so on. 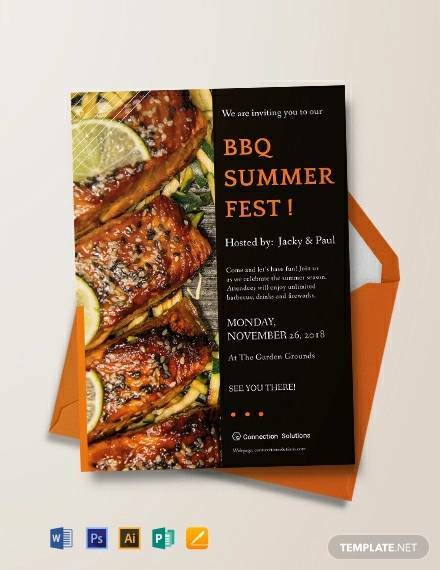 The following listed BBQ invitation templates are tailor-made for different occasions with relevant objects and style with awesome color blends. 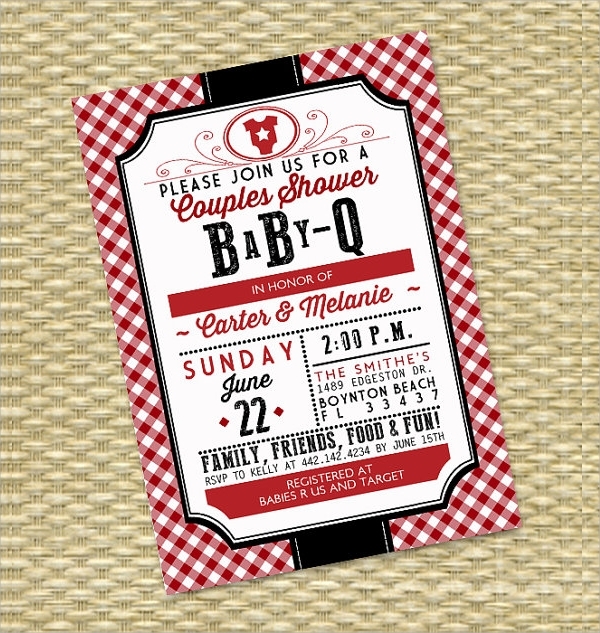 BBQ baby shower, barbecue invitations, cookout invitations and tea party invitation and much more is possible with them. They are vector, high resolution and fully customizable. You can also see Vintage Invitation Templates. 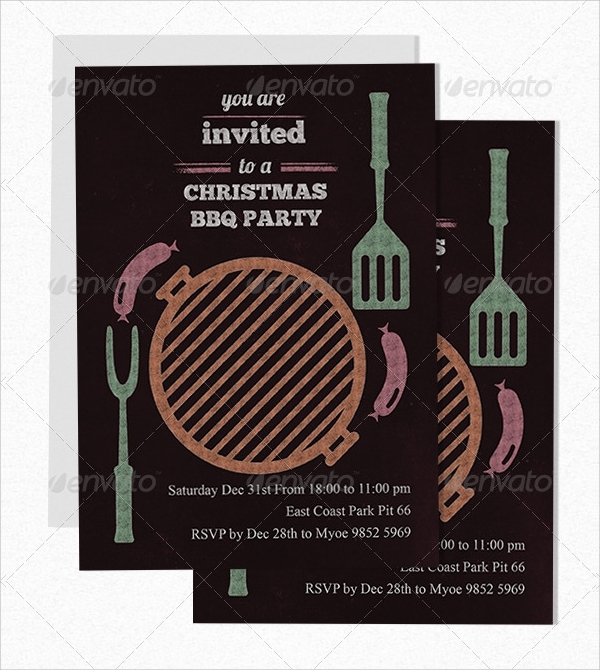 This is a wonderfully designed BBQ party invitation template with retro colored objects and it is in print ready mode and fully layered PSD file is provided with 300 dpi quality. It has a size of 5 x 7 inches. 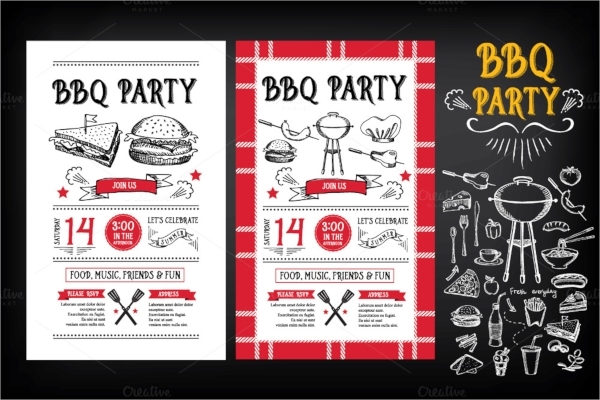 These are two EPS BBQ party invitation templates with light and dark versions. One is having white background while the other is having a black background. The design is clean and it is divided into three layouts. There are highlighters, objects, and everything is well-organized. 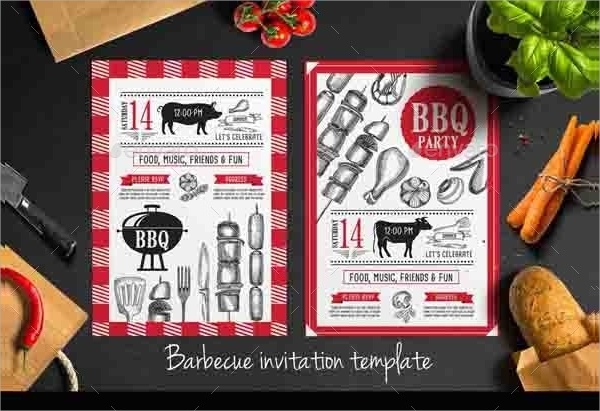 This is a very creatively designed BBQ invitation template with high resolution and stunning colors of the objects present. It is vertical in design and primarily having sweet and soothing red color. 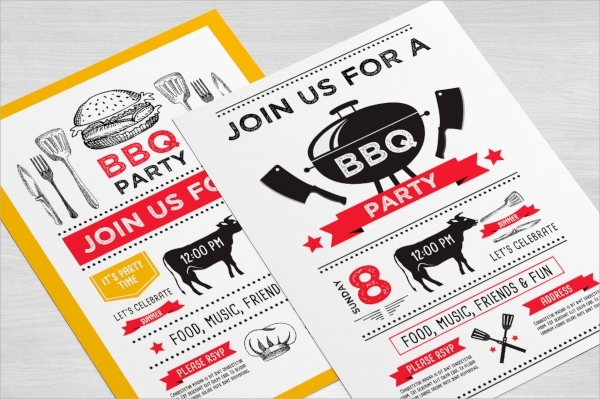 This is a vectored BBQ party invitation template with two variations in design. It is a little retro in design with heavily stuffing of objects and it is having different layouts for different purposes. A fully layered EPS file is provided for quick editing. 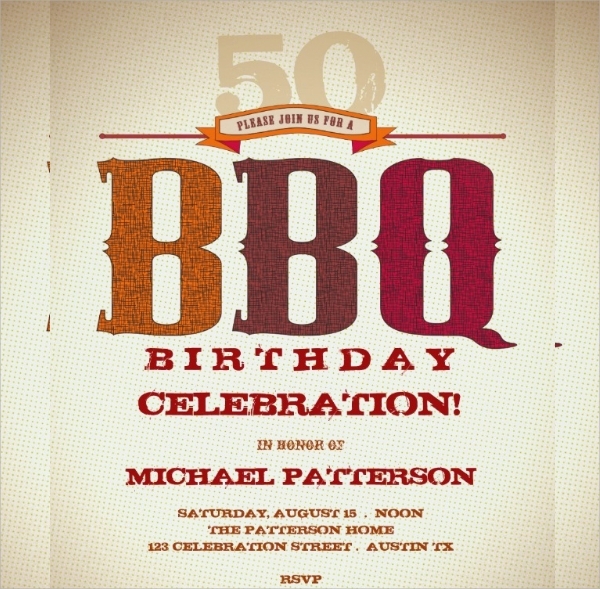 This is a great collection of BBQ invitation template with modern and retro version. It is clean and in CMYK print ready mode with great resolution. AI and EPS and PSD files are provided for easy editing and it is of size 6000 x 6000 pixels and comes in rendered JPG format. This is very simple and colorful BBQ invitation template for kids as abstract and artistic characters always attract them and the colors are bright for them too. It is vector and can fit any size with bubble speech box coming out in a funny way. 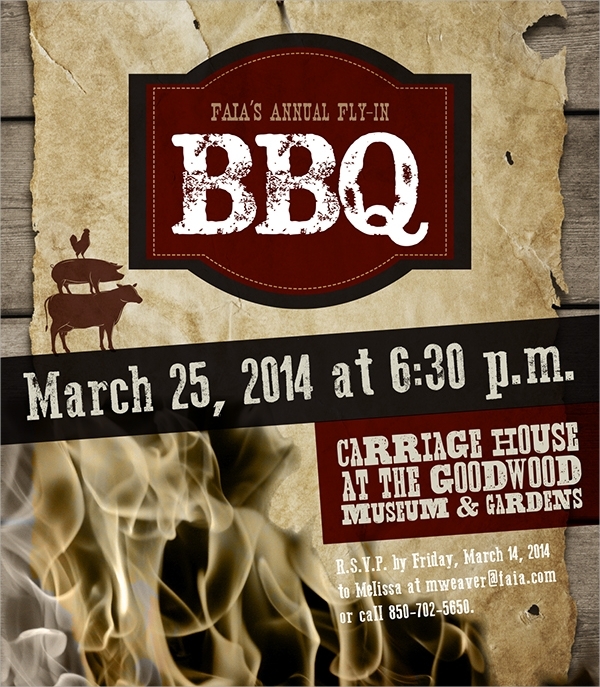 This is a classic BBQ invitation template with stunning designed and well-organized layouts. It is having superb fonts and amazing colors. It is clean and clear in design with white background and the border is well designed. You can also see Engagement Invitation Templates. 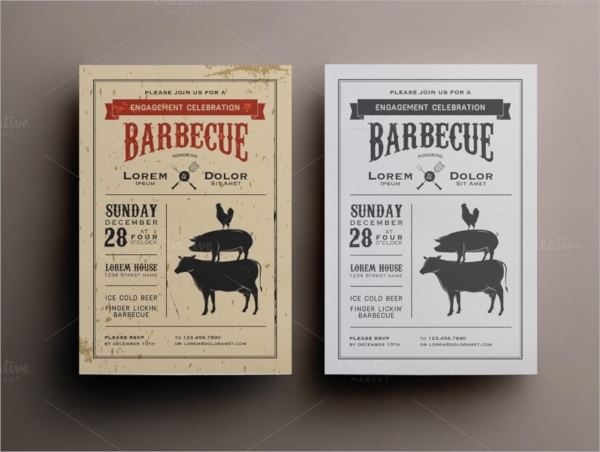 This is a great looking BBQ invitation with two different variations with terms of design and color. It is having all the layouts for different purposes and the objects are well placed. Basically it is clean and very well organized and PSD, EPS files are provided for editing it out. All amazing fonts are also provided. 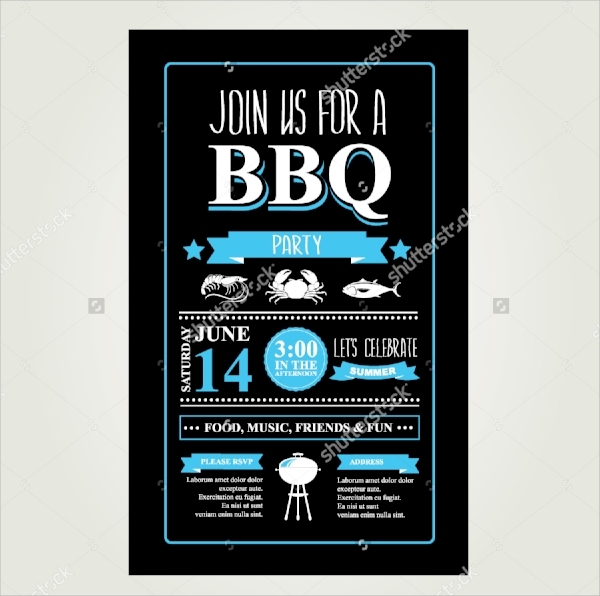 This is black background BBQ invitation design with b right sky colored text and highlighters. It is looking very attractive because of the stunning color combination and it is sure to make you proud to dispatch it among the known faces. 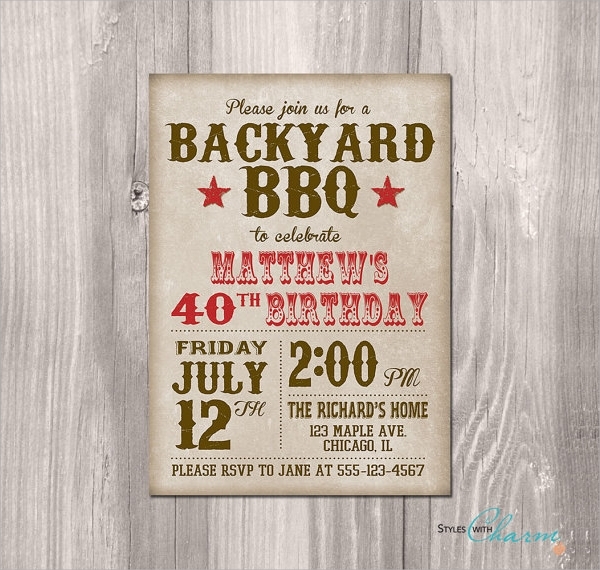 This is a grungy looking birthday celebration BBQ invitation template with size of 4 x 6 and 5 x 7 inches. All the matching items are provided in the bundle and it is super easy to edit it and insert all the relevant details and objects at appropriate areas. 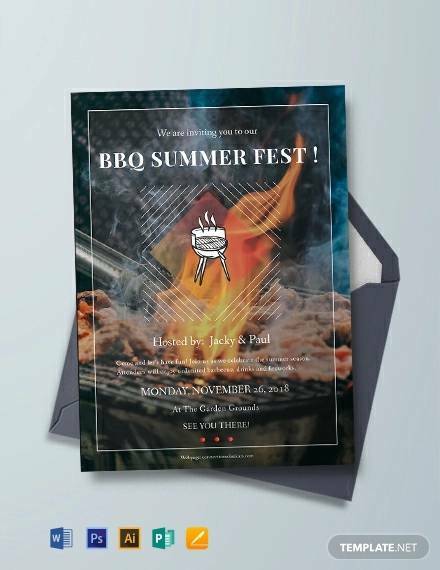 This is an amazingly designed and colored world-class corporate BBQ invitation template and it has several color variation with stunning fire effect background which is what makes it so stunning. Amazing grungy fonts and highlighters make it look attractive. 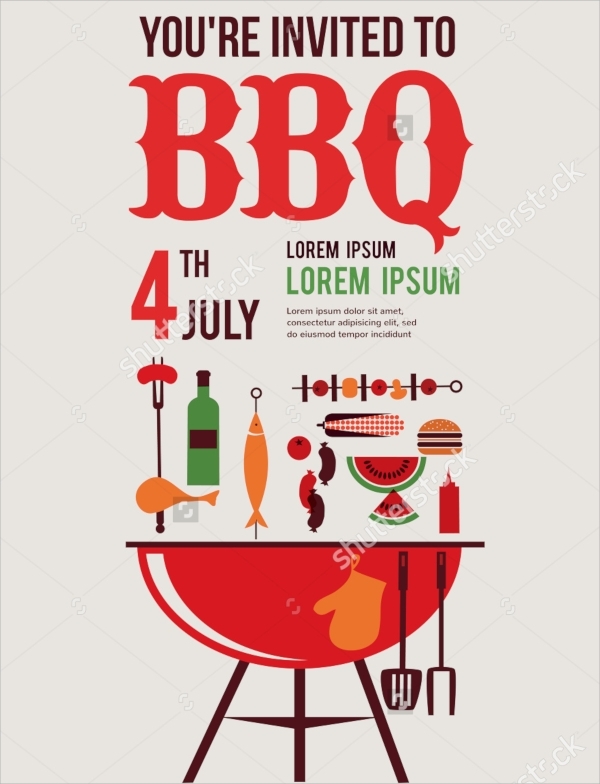 This is a BBQ invitation template with retro designing objects and white background with simple fonts. It is having retro looking highlighters and it is printable instantaneously with PSD and JPG file. 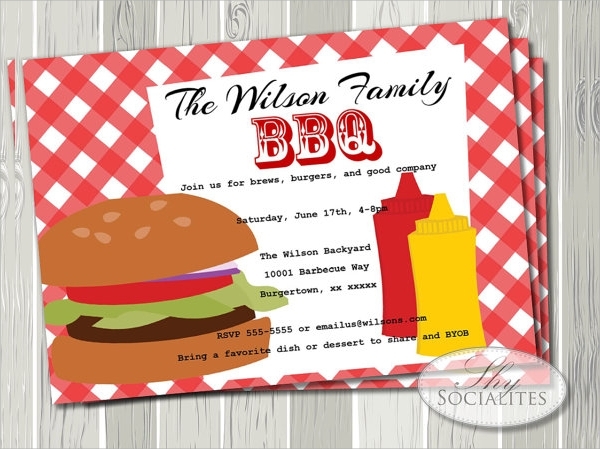 This is an artistic representation of BBQ invitation and it is mainly for kids with the objects are bright colored and the design on the background are made keeping in mind what the kids will like the best. This is a two colored BBQ invitation template with amazing sketched objects and it is divided into two row contain objects highlighters and relevant details. The border in one is stunning to look at. 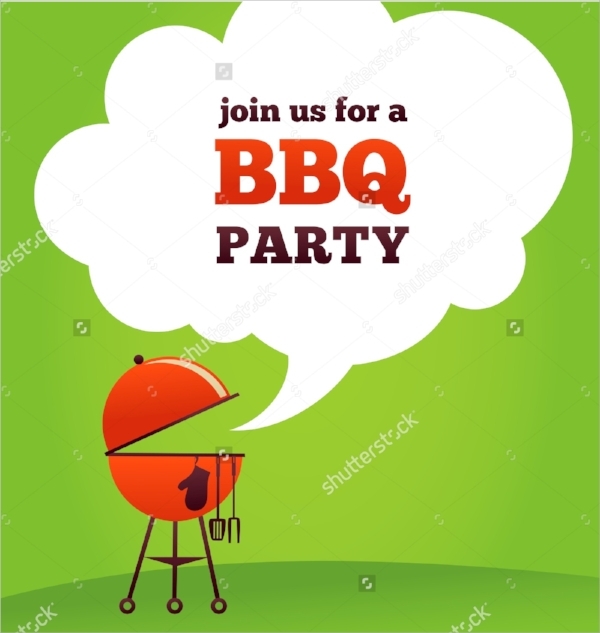 This is a simple looking BBQ invitation template a with gradient background color and simple fonts with graphical effects. It is easily customizable and available in 5 x 7 and 7 x 5 size. 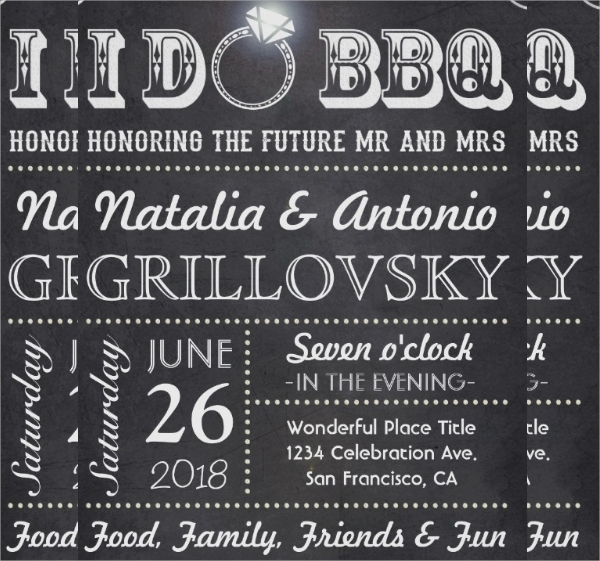 These BBQ invitation templates that we discussed just now are having all sorts of barbeque invitation types suiting to all the interested customers. They can be used as formal as well as informal invitation templates and the colors can be changed, relevant objects can be inserted and text is editable.